Figure 1 on the left side, a map showing the topology of India, SE Asia, and Australia and the major subduction zones in the region. In black is shown the outline of the subduction margin of the northern Indo-Australian plate, while minor subduction zones are highlighted in grey (modified from Richards et al., 2007). 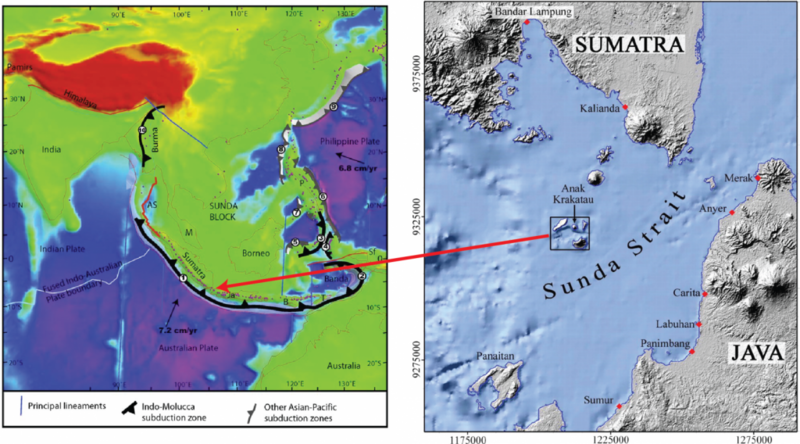 On the right, a shaded relief representation of the DEM of Sunda Strait with Anak Krakatau highlighted in the black square, taken from Giacchetti et al. (2012). The red arrow indicates where is located Anak Krakatau in the bigger map. In less than half a century of quiescence, a new volcanic cone was built within the caldera and named Anak Krakatau, literally ‘Child of Krakatau’ (Figure 1). Anak Krakatau has been actively erupting since 1927 and last December, unfortunately, made the news for causing another and unexpected deadly tragedy for people living in the area. I reconstruct here the activity of the months just before the event of the 22-23 December 2018. According to the reports provided by the Pusat Vulkanologi dan Mitigasi Bencana Geologi (PVMBG, also known as CVGHM) and the Badan Nacional Penanggulangan Bencana (BNPB) institutes, Anak Krakatau gave the first signs of reactivation around the end of June 2018. Incandescence was visible at the summit at night and ash was ejected. At this point, the alert level at the volcano was raised to 2 (on a scale from 1 to 4, with 1 the lowest and 4 the highest level of alert), thus residents and tourists were asked not to get closer than 1 km from the crater area. 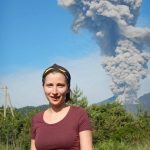 The situation remained almost unchanged during July and August, even though the ash plumes were getting denser and taller and by the end of August the volcano was not to be approached closer than 2 km. Several explosions per day became quickly the norm, Strombolian-type activity with an alternated ejection of incandescent bombs and black ash plumes, giving impressive pyrotechnic shows recorded by many visitors’ cameras and phones (examples: Video1 and Video2). In the following months, there was a general increase in the number of events per day, reaching tens to hundreds of explosions and the level of alert was still kept at 2. In mid-December, the hazard analysis for the volcano was depicting the ejection of incandescent material and pyroclast density currents (i.e. avalanches of hot clouds of volcanic ash) as potential hazards, which could eventually cause high waves around the caldera complex when entering the sea. In the meanwhile, the distribution of volcanic ash varied depending on wind direction and speed. Since December 20, PVMBG still observed a high explosive rate and a Surtseyan-type event, or in other words, magma was coming out directly in contact with water. This was interpreted as an increase in magma discharge rate, an enlargement of the crater area and a possible new crater formation closer to the water level. On December 22 at h 21:03 local time an eruption occurred and about half an hour later a tsunami hit the west coast area of Banten Province and the south coast area of Lampung Province. It was not clear from the very beginning that the two events were connected because it happened late in the evening and the dark hours prevented to see what was going on at the volcano. However, as soon as satellite images became available, it became clear that a large part of the south-west flank of the volcano had collapsed and generated landslides that caused the tsunami when entered the sea water. The original height of Anak Krakatau, 338 meters above sea level, was reduced to 110 meters (Figure 2). The toll counts more than 400 people lost their lives, more than 1000 were injured, hundreds still missing and more than 600 homes, 60 shops and 420 vessels damaged when the tsunami struck [6, 7, 8]. The region is prone to tsunamis, but they are more commonly provoked by tectonic plate subduction-related earthquakes and thus also the local tsunami warning system is triggered only by earthquake events. It is important to highlight that the same is valid for most of tsunami warning system in the world. Moreover, the eruption and consequent tsunami waves were not visible during the night and thus the people on the beaches were caught totally unprepared. Since that night, Anak Krakatau erupted again on December 26 in a Surtseyan way and the warning was raised to level 3 and maintained such up to this moment. This means that no person is allowed closer than 5 km from the volcano and people on the coasts should be prepared for additional ash falling and wear masks and goggles when carrying on outdoor activities. 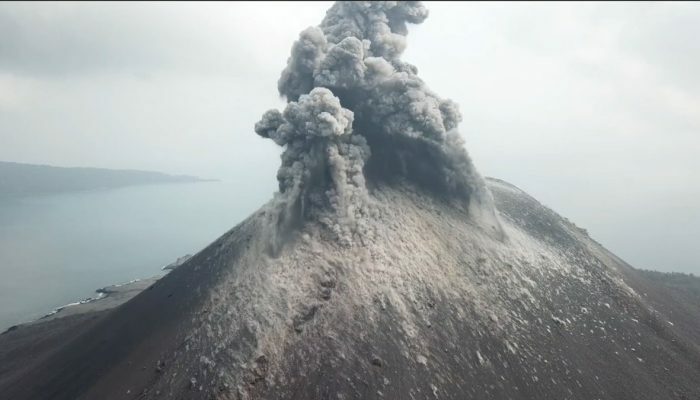 Figure 2 Incredible footage of Anak Krakatau before and after the eruption of the 22 of December 2018 that generated a tsunami. Photo credit: James Reynolds (EarthUncutTV) with permission. Was this scenario ever considered possible to happen? Unfortunately yes. Giacchetti et al. (2012) performed numerical modelling of a rapid, partial destabilization of Anak Krakatau triggering a tsunami. The interest arose from previous observation and concerns about the steep slopes on which the volcano was built and, in particular, that the volcano was growing towards South West. For these reasons, landslides along the south-western flank of the volcano could not be excluded. If occurring a landslide, it would have been directed south-westwards and would have triggered waves possibly affecting the Indonesian coasts both at the local and regional scale. In their conclusions, they also discussed the fact that the volcano ground deformation was and is not constantly monitored, nevertheless a tsunami program awareness is in place in the region since 2006, and thus that the tsunami risk due to volcano instabilities and collapse was highly neglected. Research shows that it is indeed not trivial to include volcanic sources in the tsunami early warning systems, first of all, because their footprint is variable and very different from the earthquake one. Create a warning system capable to deal with all the different source mechanisms is thus both challenging as well as desirable[13, 14]. Steps are being done in this direction [13, 15], in the meanwhile strengthening tsunami prone regions’ resilience with ad hoc education and preparedness programs remains a must.